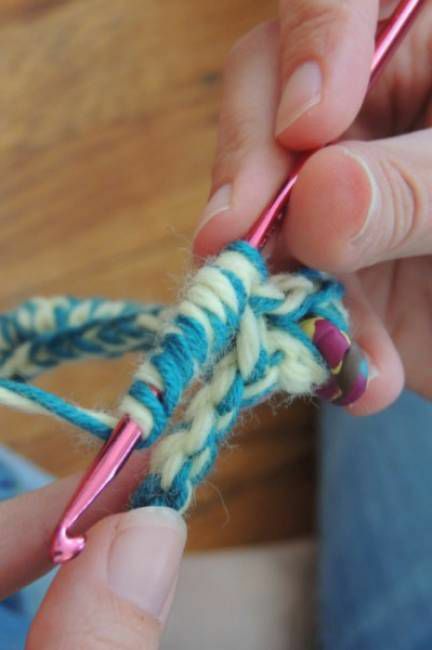 The bullion stitch is a unique crochet stitch that is worked by wrapping the yarn around the hook multiple times and then pulling through all of those yarn overs at once. The result is a highly textured detailed stitch also known as the roll stitch, a name that accurately describes what it looks like. The bullion stitch is a terrific stitch for adding almost three-dimensional details to any crochet item. This crochet stitch consists of a coil of wraps (yarn overs) around the hook, through which the thread is drawn. It is not a stitch for crochet beginners but instead is recommended for experienced crocheters who are looking to advance their crochet skills. It takes practice to learn how to pull the thread through so many loops at once. This is best achieved after practicing with basic crochet stitches for some time until you've developed a familiarity with the art of pulling yarn through loops. It is common to have at least five to six yarn overs and it is not uncommon to have as many as 10. Practice with fewer yarn overs as you get used to working this stitch. This is a stitch that is easy enough to accomplish but requires that your body get used to the movements necessary to make the stitch. Get that body memory going by crocheting a lot of bullion stitches. Yarn over as many times as your pattern calls for. Bullion stitch can be worked in different lengths and heights, which are determined by the number of times that you wind the yarn around the hooks. After completing all of the yarn overs, insert your hook into your work where you want to place the bullion crochet stitch. Yarn over and pull through all of the loops on the hook. Here, it is good to hold onto the coil of loops with your off hand while you work the hook with your dominant hand. Yarn over and pull through the last loop on the hook to secure the bullion stitch in place. Wrap the yarn loosely so that there is a lot of space between the yarn over and the hook. Try to make sure that each time the yarn is wrapped it has the same amount of tension. Pull the work through slowly. Use your fingers to lift each yarn over as you pull through. Alternatively, use a tapestry needle or a latch hook to help pull the yarn through. Tamara Kelly of Moogly has come up with a smart, fun variation on the bullion stitch, which she calls the split bullion. It's a thick bullion but it is worked across two stitches so it's easier to accomplish than if you tried to do all of those yarn overs in one fell swoop. You can see how she has used this bullion stitch variation in her Squish one-skein cowl free crochet pattern.